The ancient people in China created the first piece of furniture for people to sit on: the floor mat. Various prototypes of wooden furniture were designed around the sitting mat, such as short-legged wooden desks for the lap, chopping boards with legs, and short tables. Wealthy and important Chinese sat on platforms. Some classic forms of Chinese furniture developed as early as the Eastern Zhou period (770B.C. - 221B.C.). Often referred to in the West as "altar tables", Chinese developed long, narrow tables to hold musical instruments or to display items of wealth and beauty such as jade, porcelain or flower arrangements. 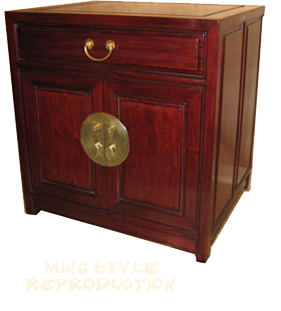 Furniture now widely regarded as Chinese in style began appearing in the Tang Dynasty (618-907 AD). 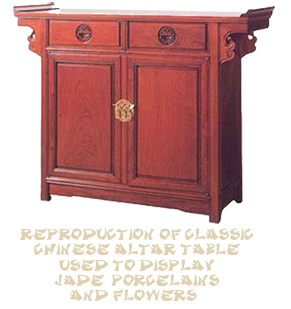 Furniture height began to rise along with the power and status of Chinese elite. (In English we speak of being "elevated to a position".)  The furniture makers of the Tang Dynasty began using high round and yoke back chairs for the wealthy elite.  Beautiful ceramics and porcelains appeared, such as the ceramic horses that are still popular in reproductions. The Classical style of Chinese furniture began in the Northern and Southern Song (960–1279) dynasty. Mid level seating became common. New furniture forms, such as bookcases, cabinets, stools and tables, were designed. New technical developments in woodworking began with the mid level furniture. Newer and more complex designs appeared, such as rounded backs that were molded to the body, Though, at first, only used by official and higher class Chinese, such furniture pieces eventually spread to the homes of all who could afford them. Long-legged beds, tables, towel racks, chairs and stools became trendy even among the peasants. But mat level sitting has never been abandoned . In China today, both elevated living and mat level forms are still in use. opium beds where one can sit cross legged and use small tables to eat from or write on while sitting on a mat or platform. detailed engravings and paintings for ceremonial purposes and artistic expression Sacred mountain images, dragons and clouds, bird and flowers all had specific Taoist connotations. During the Ming (1368 to 1644) and Qing (1644 to 1911) Dynasties the ban on imports was lifted, allowing for much larger quantities and varieties of woods to be brought in. Denser imported woods allowed craftsmen to execute finer work, including more elaborate styles of joinery. With the rapid rise of the merchant class, imported furniture styles of the West increased the desire for mid level seating. But at the same time mat level seating signaled a return to some more traditional designs. Ming Dynasty furniture items are beautifully shaped. They combine aesthetic principles and practical considerations into a graceful whole.